Go To Home PageLEFT CLICK ON ANY IMAGE BELOW TO ENLARGE! BACK ARROW TO RETURN TO THIS PAGE! contact Shawn/Annie Cohanat 860-1461 orCall Lou/Anne Vertinoat 716-796-7311SPREAD THE WORD,AND COME HAVE FUN, AND SUPPORT THE PARISH! Come, See a Great Performance Tolton, From Slave to Priest Wednesday, May 23, at 7 p.m. at Cardinal Stepinac Hall. Free will offering. Writer and director Leonardo Defilippis was originally inspired to produce Tolton while on tour in the Diocese of Springfield. “I gave a performance at St. Boniface Church in Quincy, Illinois, and there I encountered Augustus Tolton,” he explains. “I immediately began considering his life as a dramatic subject.” The late Francis Cardinal George not only encouraged Defilippis’ idea, but also sent financial support for the project shortly before his death in 2015. 7:00 p.m.: Mass of the Last Supper. 2:30 p.m.: Stations of the Cross. 6 to 7 p.m.: Confessions. 7:00 p.m.; Stations of the Cross in Croatian. 3:00 p.m. Blessing of food baskets in the church. 8:00 p.m. Vigil Mass for Easter. Tuesday, February 27, 2018 at 6 p.m.The 7th Annual Benefit Banquet for the St. Gianna Molla Pregnancy Outreach Center will be held Tuesday, February 27, 2018, at 6 p.m. at the Millenium Hotel, 2040 Walden Ave, Cheektowaga,. Tickets are $65.00 per person/students $50.00. The deadline for reservations is February 19th. 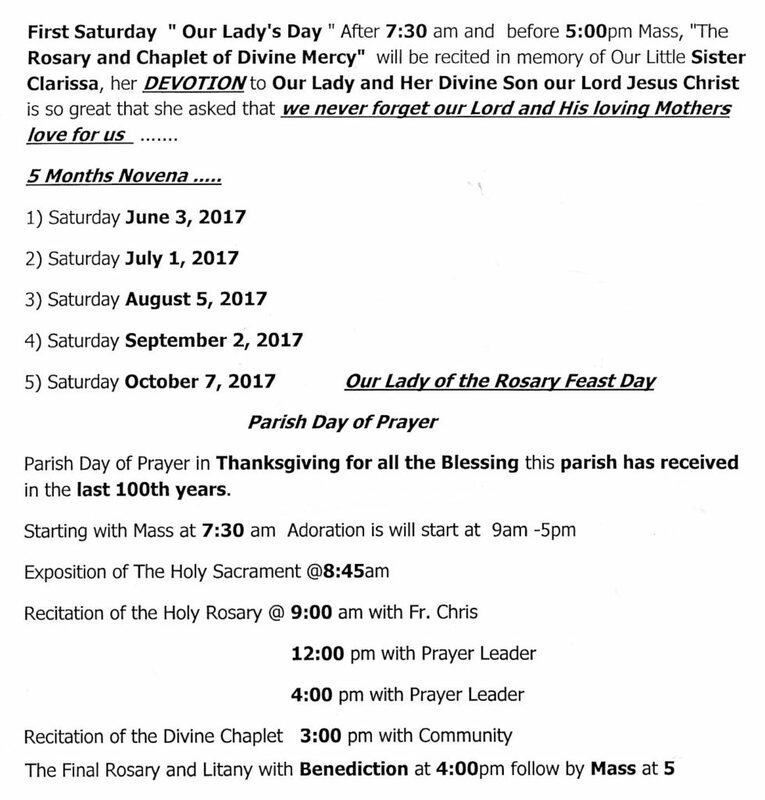 Forms are available in the vestibule of the church, or register online at www.buffalodiocese.org->Advocary & Catholic Social Teaching->Pro-Life->St. Gianna Molla Center. 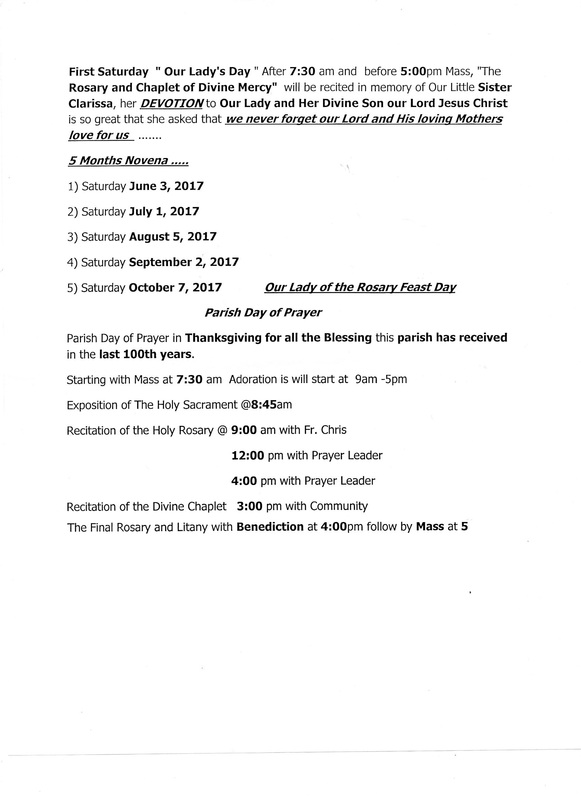 We would like to have a table for our parish, so if you are interested in going please contact Jane Mead (827-1923) to let her know. Sunday, February 25th, 2018 – from 8 a.m. to 12 NoonScrambled eggs, sausage, bacon, hash browns, corn bread, breakfast roll, coffee, tea, milk and juice.Presale tickets: $7.00;Tickets bought at the door of our hall: $9.00.Tickets will be sold in the vestibule of our church after Mass on February 4, 11 and 18. Sunday, February 4 at 10:00 a.m. OR Wednesday, February 7 at 7:00 p.m. Anyone who is out of High School, has been Baptized and made their First Holy Communion has an opportunity to be Confirmed at the Easter Vigil. Eight sessions will be held and each session will last l.5 hours. On Sunday, November 19th, 2017 the Thanksgiving Bake Sale will be held at our Cardinal Stepinac Auditorium from 8 a.m. to 3 p.m. Dates of preparation will be announced in next Sundays (11/05/17) bulletin. 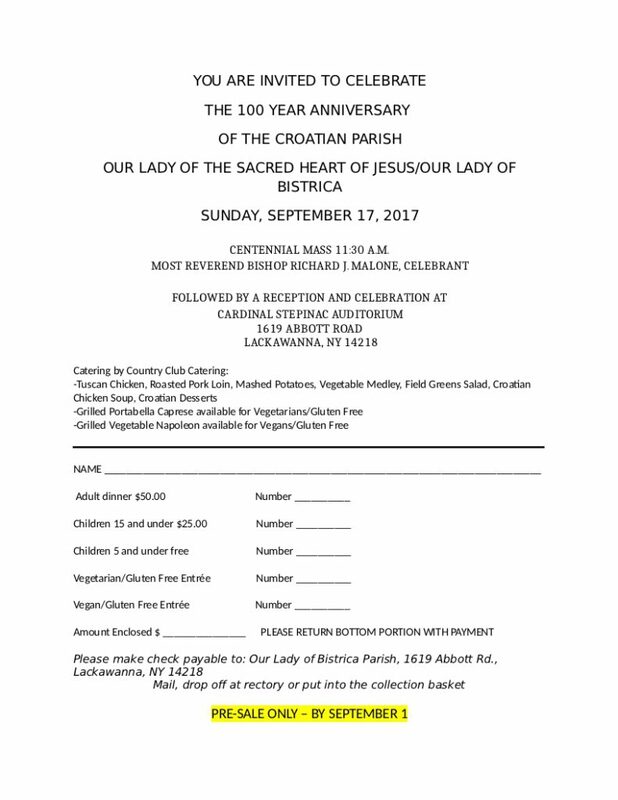 Our Croatian Roman Catholic Church is celebrating 100 years as a parish! This is a great celebration! We thank God that our parish has survived 100 years! Nineteenth Liturgical Feast of the Blessed Aloysius Cardinal Stepinac. This was decreed by Pope John Paul II at the beatification ceremony of Blessed Aloysius in Marija Bistrica, Croatia, on October 3rd, 1998. This date is also the anniversary of his saintly martyr’s death in Krasic, Croatia, on February 10, 1960. If you have artifacts or photographs to loan or donate for display in our museum, contact Nancy Kezman-Amadori at (716) 725-5406! Come to our Lawn Fete on July 22-23, 2017. Hosting Terry Buckwald and Maestral. Serving Lamb, Pork, Cevapici and Sarma. 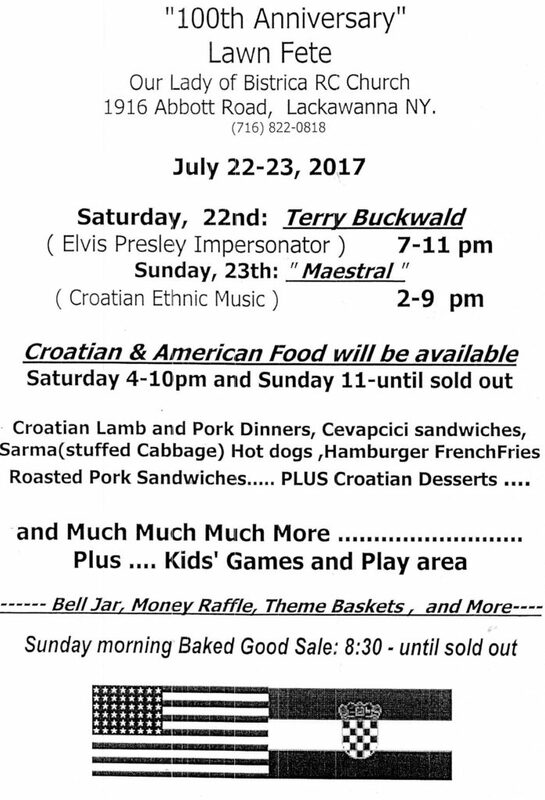 We will have Kid’s Games, a Baked Goods sale and much Croatian food’ many Croatian desserts and a lot of Croatian music. Win a theme basket in the raffle. 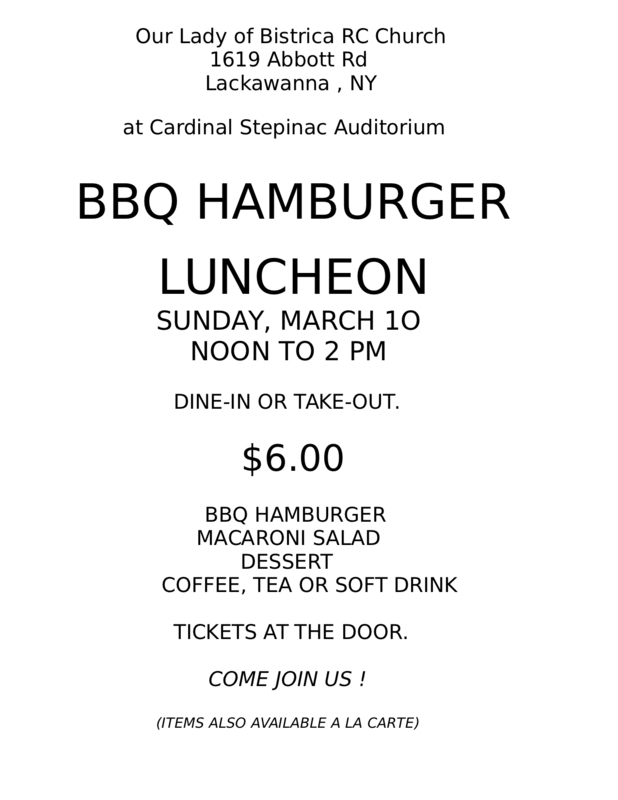 Buy a roasted pork sandwich, a hamburger or Croatian sausage to take home with you! Come join us at our 100th Year Anniversary Celebration and Dinner with Bishop Malone on September 17, 2017!